These 6 tips from an interior designer will help you create and complete a polished, clean, shiny look to your flooring that you’ve always wanted in your home. Light hardwood floors with dark furniture will always make the two stand out, as well as fit well together to complete a homey look. Mixing and matching flooring can be difficult at times, especially without using those ugly transition strips. Luckily, it can be easier than you think to find a way around using transition strips, while still making your flooring look beautiful. Whether you’re changing the flooring of your entire home, or just switching it out room-by-room, our interior designer can help you meet your needs. 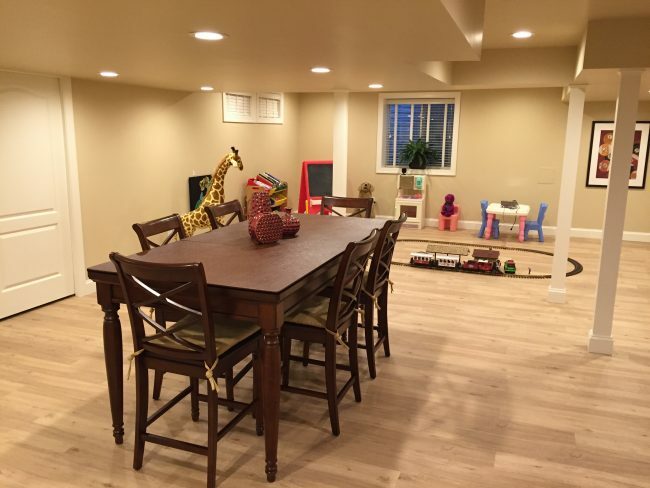 Barbara Lipe, lead interior designer for a hardwood flooring installer, has over 30 years of experience, and can give numerous insights to assist in smoothly transitioning different styles of flooring together. Our tips, along with Lipe’s help, can make sure your home’s flooring looks brand new, right out of an IKEA catalog. 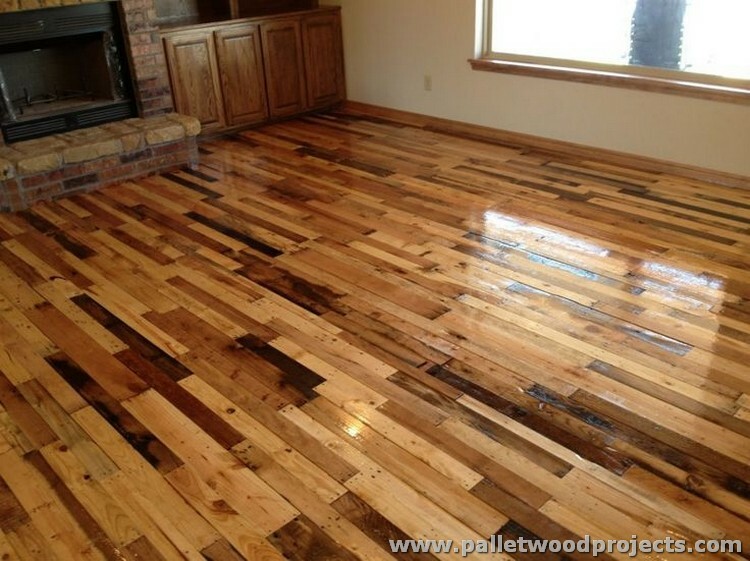 This picture shows what is possible with contrasting vinyl wood flooring; a beautiful wood pallet flooring. There are many ways to make flooring transitions look stylish. A popular method to achieve this look is to simply match colors with their opposites. For example, Lipe suggests using darker furniture on lighter floors and vice versa, to help create that contrast which helps the flooring catch people’s attention. Mix and match: different colored luxury vinyl planks, or luxury vinyl plank and ceramic tile. Here is an elaborate herringbone vinyl plank pattern with contrasting colors of wood, which are also facing different directions to create a stylish look. 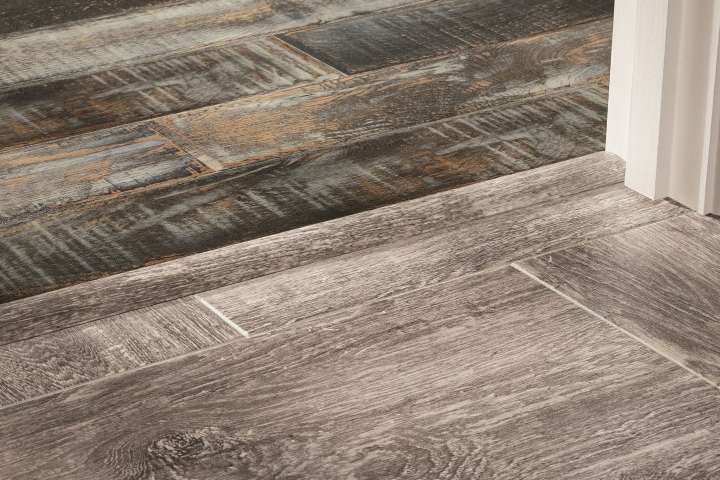 Mix and match: luxury vinyl planks. Mosaic-tile transition strips can be an effective way to blend tile with wood flooring, or with two different kinds of flooring together. If you want an eye-catching transition, mosaic-patterned transition strips are a good choice. They help to smoothly blend the two different types of flooring, and will always receive nice comments from houseguests. “It’s a win-win,” Lipe says. This photo displays how wooden floor strips can make a smooth transition from a light tile to a darker wood. The wooden strip has different direction than the wood flooring which helps to blend the two floors as well. Creating a smooth flooring transition from wooden floors to a room with tile floors can be quite a pain. However, there are keys to these annoyances, such as using wooden floor strips that are the same color as the wooden flooring. This will help simplify things, and make the transition look nice. Mix and match: luxury vinyl plank and ceramic tile. Curved carpet lines are a useful technique to stylize your home by adding something different and out of the ordinary but still keep that clean look. Another innovative and useful technique you can use to mix and match the flooring of your home is to curve your carpet line. This modern method is perfect for altering an open floor-concept room into a stylish multipurpose area. “Sometimes a curved line is a great way to bring you into your space,” Lipe says. Mix and match: carpet and luxury vinyl plank, carpets, or carpet and ceramic tile. Here is a perfect example of a subtle color transition where two slightly different colors of wood flooring are connected smoothly by taking advantage of this utilization. Sometimes too much contrast when transitioning the color of each room of your home can be a bit overwhelming. Using small differences in the shade of colors can be simple and effective in creating a light shift between two ceramic tiles of opposing colors. It is important to note that shade can make the entire difference between a smooth transition and a choppy transition when choosing colors for tiles of adjacent, connecting rooms. Mix and match: ceramic tiles, or ceramic tile and luxury vinyl in stone. What do you think of these floor matching concepts? Let us know in the comment section below. These are really interesting floors! I rent still, but I like to daydream about designing my first owned house and floors are a big thing for me! Wish I had the money and time to renovate our house! All these suggestions and tips sounds interesting! These look super lovely! Kitchen floor should always match with the counter, that’s all I’ve learnt (my mum is interior designer). You shouldn’t underestimate the importance of floors! Our flat has dark hardwood floors and honestly, they’re pretty much the reason we chose to buy this property and not another one. Great post hun. This is a beautiful setup. I love the furniture. I love these floor matching concepts. Very original. All the floors in our apartment are the same (white tile) so no need for fancy matching. Hopefully we’ll get rid of them some day because I certainly miss hard wood and carpet, haha. We’re looking to redo some of the flooring at our place later this year so this is inspiring me to look at other options now. Love the alternate colour wood floorboards idea! These are such great ideas. I’ll be using some of these – my fav is the curved carpets! !